AMPA — Lightning Bay Pneu-draulics has found a path to growth from Tampa’s waterfront docks through the phosphate mines of Polk County and the amusement rides at Disney. The eight-year-old company has weathered the worst of the recession and continues to face workforce challenges. Now Lightning Bay is building its own headquarters after years of leasing industrial shop space. The company expects to top $2 million annual revenue for the first time. “We recognize when things are happening and we change our business dynamics to fit what is going on,” said company PresidentPamela Fay. Pamela and David Fay started the company in 2004 with their own money. He was an experienced hydraulic field services technician. She was a Blake High School biology teacher and Green Iguanabartender. She did the books. He made the repairs. They both made sales calls. The business grew from a pickup truck to it recent purchase of a $50,000 honing machine. A lot of work has come from the Port of Tampa, where the company services cranes, winches and steering systems, and from the phosphate mining industry, where it works on drag lines and processing plant equipment. Along the way, Lightning Bay has grown to 15 employees. But finding and retaining skilled workers is one of the company’s biggest challenges, Pamela Fay said. “This is not the same as working on a car,” she said. Skilled pneumatic and hydraulic workers can earn from about $80,000 into the six figures with good benefits, Fay said. 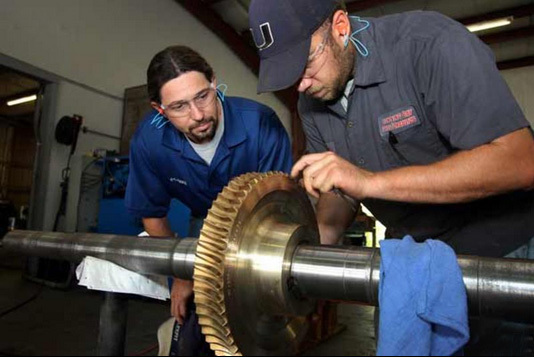 The lack of skilled laborers is not just a Tampa problem. “It’s a challenge all over the U.S.,” said Donna Pollander, executive director of the International Fluid Power Society. And the problem isn’t confined to pneumatic and hydraulic workers. NAM attributes the broadening skills gap to several factors, including retiring baby boomers, advanced technology that require new skills, and increased global job competition. Fay said Lightning Bay puts a premium on providing good employee benefits. “We want them to know we appreciate them,” she said. The company is building its headquarters on a 5-acre lot at 1221 S. 82nd St. south of Palm River Road in East Tampa. Fay said the company made the purchase in cash but will recoup some of the investment through its $1.1 million construction loan from Great Florida Bank. Lightning Bay Industrial, spun off from Lightning Bay Pneu-draulics to handle general contracting work, will do most of the construction on the nearly 15,000-square-foot building. That’s about double the space it is currently renting for at its current location.